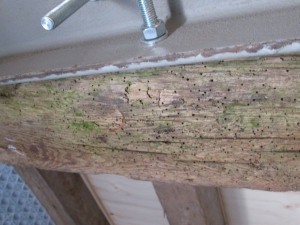 Woodworm infestation is a very common problem in many buildings constructed over 20 years ago, particularly in this damp southern environment, but one which can be easily eradicated using the safest modern treatments available. 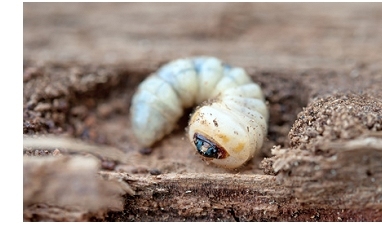 Woodworm is caused by four types of woodworm beetles resident in the UK. 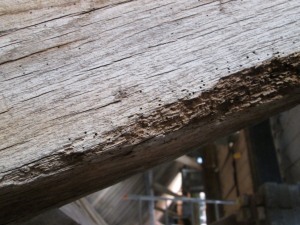 It is a common misconception that woodworm only affects old properties; in fact it can cause damage to newly constructed buildings as well as old. Powderery dust around said holes, this is known as frass. Crumbly edges to boards and joints. 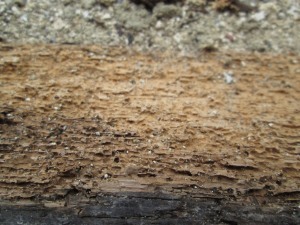 The grub or larvae of the beetle burrows through the timber, feeding on the wood substance, often seriously weakening the structural timbers throughout the property. Attack is not confined to old timbers and nearly all new wood used in the construction of buildings is susceptible unless pre-treated. Floor joists, roof timbers and staircases are often particularly prone to attack. Our surveyors are trained to identify the nature and degree of infestation and will recommend suitable remedial work. Treatments are usually carried out by pressure spraying the exposed timber with suitable chemicals although in certain instances, Boron gels and rods maybe used. Timber treatment paste may also be specified in order to provide long term penetration. Our woodworm services cover the whole of Hampshire so please just get in touch to find out more. Very clean tidy work, promptly done very pleased with the result Colin Wilson, Clover Cottage, Meonstoke.